In 2018, capital investment in companies that are developing AI-enabled medical image analysis solutions was almost $580 million. This was more than double the investment into such companies in 2017. You can download our free report here. Following the peak of new market entrants in 2015/16, the amount of early-stage (Angel, Seed and Series A) investments has since declined. In 2018, investors appear to have shifted their focus to later-stage (series B onwards) investments, although the number of early-stage deals was still slightly higher than later-stage deals. 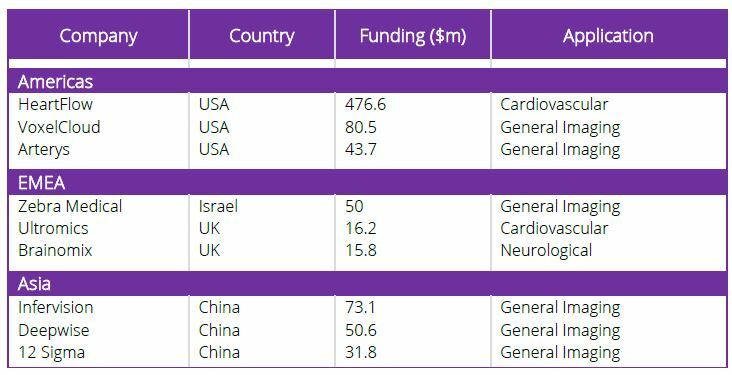 In 2019 we expect investors will favor the more established medical imaging AI companies and early-stage funding will continue to decline. Funding continues to rise each year, with $580 million invested in 2018. The Machine Learning in Medical Imaging market intelligence service is an annual subscription that provides, reports, databases, presentation, briefings and insights on the world market for AI-based image analysis.